It’s Day 4 of the Root for Reutter countdown and World Championships are fast approaching. Katherine had an interesteing proclamation after winning in Vancouver that resulted in the picutre to the left. So today’s question will not only honor whimsy, but also seek to send Katherine the sweet taste of victory to end her season. Question of the Day: How many scoops of ice cream did Katherine eat after her silver medal win in the Vancouver 2010 Olympics? Sidenote about Day 3: We realize that yesterday’s question wasn’t specific enough therefore we are accepting correct answer for all World medals and total World Cup medals. You scream, I scream – we all scream for ice cream, but Katherine SCREAMS for ice cream! Number of scoops??? – too many for me! 18 scoops, but did she actually eat all 18?!? She did not have any as she is very careful of what she eats. 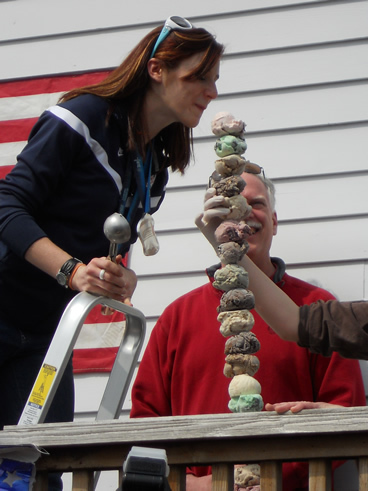 It was an “18 scooper” with a new flavor that combined strawberry, coconut and fudge swirl ice cream. Katherine, did you name that flavor Strawberry Short Track or did you name it something else? Okay everyone she still had the relay to race so I’m sure she didn’t eat all 18! And she is very careful with her diet. My guess is 2 scoops to celebrate her silver victory. Looks like about 20 to me, but she likely did not eat them all. I won’t reveal the amount of scoops but I can tell you that Katherine finished all of them! I cannot imagine her eating 18 scoops, but will go with it. 18 scoops at Capannari’s in Mt. Prospect, IL ~ BEST ICE CREAM EVER! It was 18 scoops! Did she actually eat them all??! I’m smart enought to follow the crowd -18. Laura – Thank you very much for promoting the contest in your forums. 18 scoops! So crazy, shes seems to be so careful with her diet! 18??? Can’t believe she ate all that ice cream.